To follow up from my CATS lecture on Semiotics I was given a task worksheet to do which would test my understanding on semiotics and also get me to do my own semiotics reading on a image. Here are the task objectives I will follow. 1. Definitions- Note down the definitions of key terms from today’s session in your logbook. For example: Semiotics, signifier, signified, denote, connote etc. 2. Key thinkers- Note down a short biography and key ideas associated with Ferdinand de Saussure, Charles Sanders Peirce, Roland Barthes. 4. Find an example of contemporary advertising and undertake a semiotic reading of your image. Semiology- The study of signs, signals, symbols, gestures and messages. Semiotics- The study of signs and symbols and their use or interpretation. 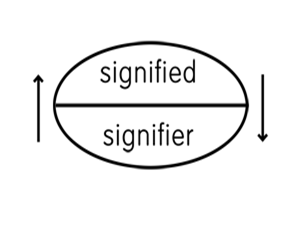 Signifier- a sign’s physical form (such as a sound, printed word, or image) as distinct from its meaning. Signified- the meaning or idea expressed by a sign, as distinct from the physical form in which it is expressed. Denote- be a sign of, indicate. simile. Connote- imply or suggest (an idea or feeling) in addition to the literal or primary meaning. metaphor. Arbitrary- based on random choice or personal whim, rather than any reason or system. Polysemy- the ambiguity of an individual word or phrase that can be used (in different contexts) to express two or more different meanings. Semiotics give you a range of meanings to just a basic picture, you are basically deconstructing or decoding the works to find out through semiotics what the meanings or purpose of that particular part in an image could be. Ferdinand de Saussure- In 1906 Saussure taught a course on General Linguistics at the University of Geneva. His teachings were so monumental his students published a document of them, using their lecture notes to guide them. He was interested in the state of language, moreover, ‘an understanding of the conditions for existence of any language’ and the nature of the linguistic sign. From this he argued the linguistic sign or ‘unit’ was a two-sided entity. 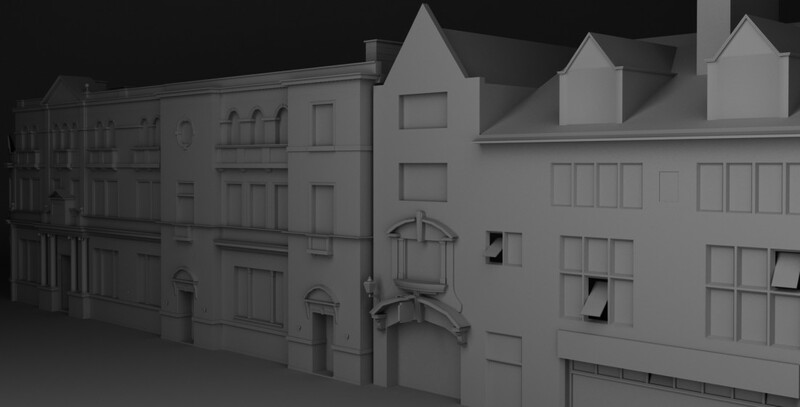 This he called a dyad (picture on the left). And this is what they define. The connection between the two is in fact what we call arbitrary meaning based on random choice or personal whim, rather than any reason or system. “[…] it has never been in my power to study anything,—mathematics, ethics, metaphysics, gravitation, thermodynamics, optics, chemistry, comparative anatomy, astronomy, psychology, phonetics, economics, the history of science, whist, men and women, wine, metrology, except as a study of semiotic” (SS 1977, 85–6). An Icon- ‘where the sign relates to its object in some resemblance with it, i.e. a photograph’. It physically resembles what it stands for. A Symbol- ‘where the sign relates to its object by means of convention alone, e.g. word, a flag’. Relates to via social convention. An Index- ‘where the sign relates to its object in terms of causation, e.g. sundial, paw print, medical symptom’. It correlates with or points to. So leading from this a sign can be iconic, symbolic and indexical. Roland Barthes- Barthes was interested in the connotations of meaning in an article he published called “Mythologies” he explored the denotations of popular cultural French signs, he argued that certain signs betrayed their convention as they are myths, this is how connotations are constructed. his ideas were very similar to that of Peirce in that icon, symbol and index was changed by Barthes to Linguistic message, Coded iconic message and Non-coded iconic message so a more insightful look into semiotics with these 3 steps. An example of an icon (Icon definition- a person or thing regarded as a representative symbol or as worthy of veneration.) would have to be people that inspired other and changed a generation, so musically iconic is like Elvis the king of rock and roll is iconic, scientific would be Albert Einstein with all his theories and discoveries, boxing Muhammad Ali, or political like Ghandi. And so on there are many icons in this world and some people have personal preferences to who is an icon to them. A symbol example would be just to give one, the cross of Jesus Christ, this is probably the most symbolic symbol in the religious world of Christianity for many reasons and it is a symbol of the sacrifices he made for our race. An index example is where the sign relates to its object in terms of causation, e.g. sundial, paw print, medical symptom or a clock, it correlates or points to something. To begin my semiotics reading on this picture I made sure I fully understood myself what semiotics is by re-reading my notes. So you have its a smoking advert so the man is therefore being misleading about health by saying “come to where the flavour is”, being an advertisement it is all about promoting the product to the customers to try persuade them to buy the product. The red background signifies danger in most cases but I think Marlboro wanted red to be passion in this case so you have a passion for smoking their cigarettes. the white shirt and hat suggest peace, purity and calmness so he is there to be a role model to promote the idea that smoking is cool and it will make you feel the same way. 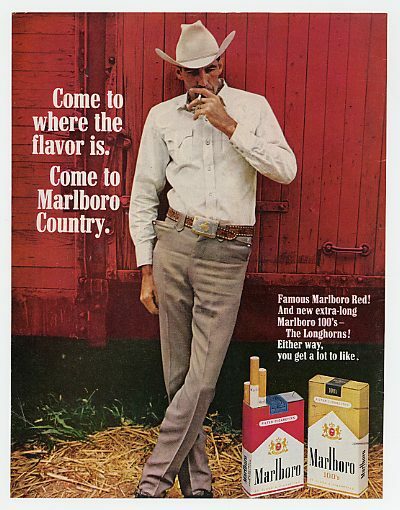 “Come to Marlboro country” this is there to give you the idea that you are joining into a community of other people who are Marlboro smokers to allow you not to be alone as you are in Marlboro country by smoking their product. The text above the cigarette boxes uses exclamation marks to try amplify the importance of the product “Famous Marlboro Red!” its all to be shouting at you buy me now! The colour choice on the boxes of red which again is passion in the companies eyes but as we know red is also danger and smoking is dangerous to your health, but then you have a gold box which signifies premium, rich and quality to the product “you get a lot to like” is what they think of this. The coat of arms/badge/ logo of Marlboro also gives you the signs of rich and premium cigarettes not just any normal cigarettes. His body language suggests he is relaxed and all chilled out in Marlboro country which attracts you to think I want to be relaxed and join him. Its all propaganda to make you buy the product but without using semiotics you wouldn’t realise this normally but you might be thinking it when you look at an advertisement its there to imply a meaning. so semiotics is useful in analysing a range of meanings in just an image. Categories: CATS | Tags: index, Semiotic, Sign, symbol | Permalink.